Bees play a vital role in the production of our food, as well as the functioning of our ecosystems. A recent decline in the global bee population means that now, more than ever, we need to protect and support our helpful little friends. This week, we speak with For the Love of Bees, a local organisation on a mission to make Auckland the safest city in the world for bees. You may have noticed a buzz around Auckland recently (and no, I’m not referring to the swarm of British and Irish fans who took over the city for the Lions tour). Since 2014, there has been a growing movement to improve the safety of bees in the city. Yes, you read that right – bees, those bristly little creatures who can cause quite the annoyance when they sting you. 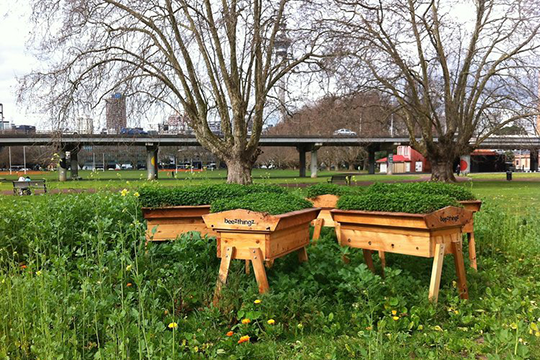 Auckland’s ‘bee friendly’ movement started in 2014 with The Park, an immersive artwork anchored by six beehives in Victoria Park. The project was initiated, designed and planted by local artists Sarah Smuts-Kennedy and Taarati Taiaroa. 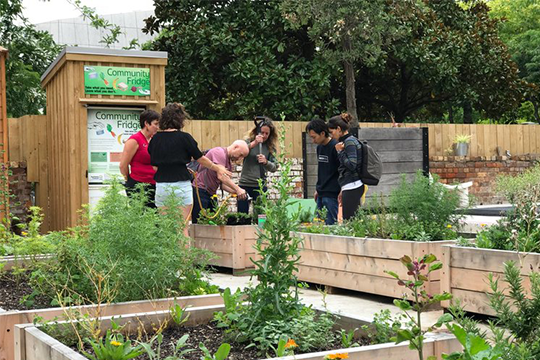 The concept has since evolved into For the Love of Bees, an educational program focused on creating an ecosystem that supports thriving beehive colonies by introducing hives and a ready supply of bee friendly food throughout our city. We spoke with Dirk Peterson of For The Love of Bees about the origins of the project, and we’re its heading. How did the idea of For the Love of Bees come about? For the Love of Bees was born out of the social sculpture The Park, which was started by Sarah Smuts-Kennedy and Taarati Taiaroa back in 2014. The Park materialised through an Auckland wide public initiative and was anchored by six beehives located in Victoria Park. 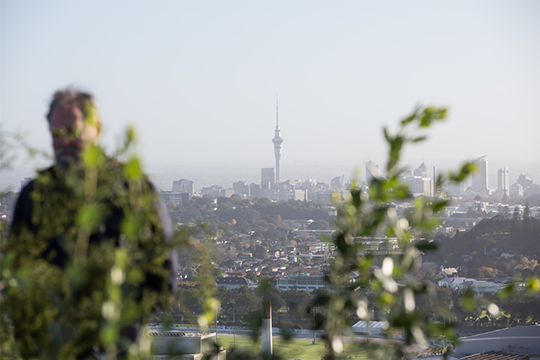 The project’s main objective was to quantify the working patterns of bees by utilising mapping resources to document the location of the community-initiated gardens, or ‘Pollen Hotels’, that nourish Auckland’s bee population. For the Love of Bees was inspired by the conversations that took place throughout the life of The Park. The project is run by vision holder and biological gardener Sarah Smuts-Kennedy, who’s primary objective is to unite our local communities and make Auckland the safest city in the world for bees. Six beehives located in Victoria Park anchored The Park, which has evolved into For the Love of Bees. Why is it important for our cities to be safe for bees? Bees provide us with important economic and ecological contributions absolutely free of charge. They play a vital role in the production of our food, as well as the functioning of our ecosystems. Globally bee populations are in decline, this is primarily due to habitat destruction, loss of food sources and the impacts of pesticide and insecticide use. Cities can play a vital role in stabilising and growing the bee population. In New Zealand the beekeeping sector is rapidly expanding, we now have more than 800,000 hives nationally. This huge increase in bee numbers can only be maintained if there is an increase in the flowers and other plants that bees rely on for food. A single colony requires billions of flowers every year to stay healthy; a single female worker bee will only produce 1/12 of a teaspoon of honey in her entire lifetime, which means every teaspoon we eat takes the lifespans of twelve bees to make. Being a bee safe city therefore requires more than making a home for bees, we also need to provide them with the nourishment they require to thrive. Bees do so much for our society and it’s only fair we respect and support their environments the same way that they support ours. 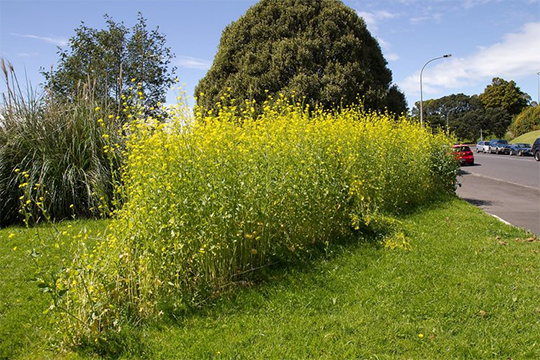 The Griffiths Gardens offer a sanctuary for bees within Auckland’s city centre. How does the design of our urban environment impact on the health of our biodiversity? 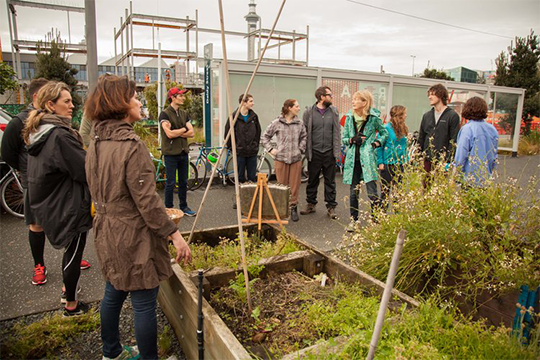 In order to protect and improve Auckland’s unique biodiversity it’s essential to protect green spaces, encourage the integration of ecologically sustainable initiatives (such as inner-city bee colonies fostered by diverse pollen networks) and introduce infrastructure that educates the public on the importance of biodiversity to urban life (such as the free sustainability workshops held by For the Love of Bees). In terms of the health of our bees, the inclusion of organic, biodynamic green spaces in our urban environments is very important. Bee populations need pesticide and insecticide free food sources to flourish. Community-initiated strategies, such as For the Love of Bees, are an effective tool for leading Auckland away from the systemic use of pesticides and insecticides, towards biologically regenerative processes. An example of ‘pasture painting’, geometric plantings which make public spaces more productive for bees and wildlife. Is the health of bees in a city indicative of how healthy the city is for people? Absolutely. The pollination provided by bees directly impacts many aspects of inner city living. Bees support our production of food, without their free pollination services we would struggle to produce many of our staple fruits and vegetables. Bees also support the regeneration of our green spaces, which in turn absorb carbon and produce the oxygen we need to survive. Bees have more of an impact on our urban environment than many people realise. Healthy bees = healthy city. For the Love of Bees is heading in to the second half of 2017 with all sorts of fantastic opportunities for collaboration in the inner city. We are currently developing a set of teaching tools that can be distributed through our public workshops and digital channels: these tools will be given to schools to influence future generations of biological gardeners and organic beekeepers. We are also looking to expand our online presence with more photos, videos and web resources that will impact communities locally and globally. We are always looking to expand our reach to new communities and everyone is welcome to join in and help out. For the Love of Bees will be further expanding their workshop programme in the second half of 2017. To learn more about For the Love of Bees, or to check whether one of their free workshops is on in your area, check out their website, Facebook, and Twitter.